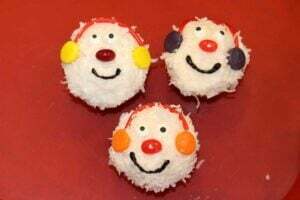 We loooovvvee the Abominable Snowman from Rudolph the Red Nose Reindeer, so we thought we would try to re-create him in a cupcake!!! How cute is that?? This is ridiculously easy to make – I even did it (granted I had morale support and physical support from my mom and of course, my sister!) All you do is prepare the cupcakes as directed. Be sure to let them completely cool. Frost the cupcakes and roll the top in the coconut. Separate the Pull & Peel Licorice into individual strands and cut the licorice into about 2 inch pieces. Lay it across the top section of the cupcake and put a Spree on either end. 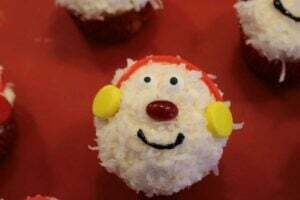 Add the eyes and jelly bean nose – we used a little frosting on the back of the candy to help it stick. Finish them off using the sparkle gel for the mouth! Once the cupcakes are cooled, it took us about a half hour or so to decorate (and two minutes to eat!) It was super fun and a great family activity! 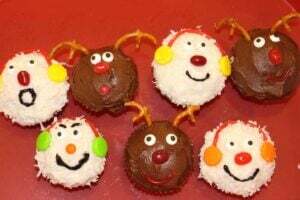 Don’t miss out on my cute Rudolf the Red Nosed Reindeer Cupcakes!! 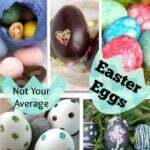 Check ’em out here!